"So the son left and went to his father. 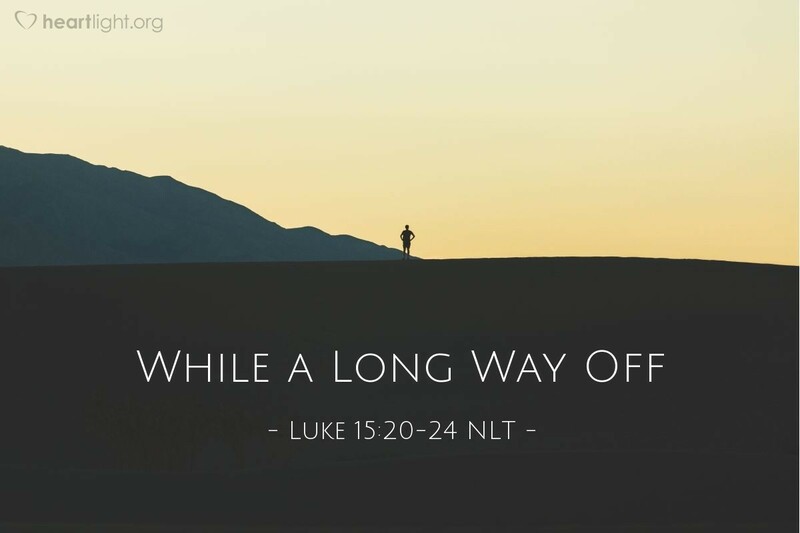 While the son was still a long way off, his father saw him coming. The father felt sorry for his son. So the father ran to him. He hugged and kissed his son. The son said, 'Father, I sinned against God and have done wrong to you. I am not good enough to be called your son.' But the father said to his servants, 'Hurry! Bring the best clothes and dress him. Also, put a ring on his finger and good shoes on his feet. Bring our fat calf. We will kill it and have plenty to eat. Then we can have a party! My son was dead, but now he is alive again! He was lost, but now he is found!' So they began to have a party." I love the sentence, "And while he was still a long distance away, his father saw him coming." The Father was longing for his son to return. He was waiting for his son to return. He was ready for his son's return. Our Father in heaven is filled with love and compassion for us. He sees our hearts and runs to meet us when we turn our hearts toward home—no matter how far we may have strayed. How far is your heart from the Father? I'm not talking about how things look on the outside to others. His concern is with your heart. Is it turned toward him? Is it open to being honest with him about your rebellion and sin? He is not looking to punish you, but to bring you home ... to bring you back to life ... to have the party begin. Loving God and compassionate Father, thank you for knowing me and loving me. Look into my heart and examine my inmost thoughts. I am sorry for my sin. Thank you for making me a welcome child in your house and drawing me close to you. In Jesus' name I pray. Amen.